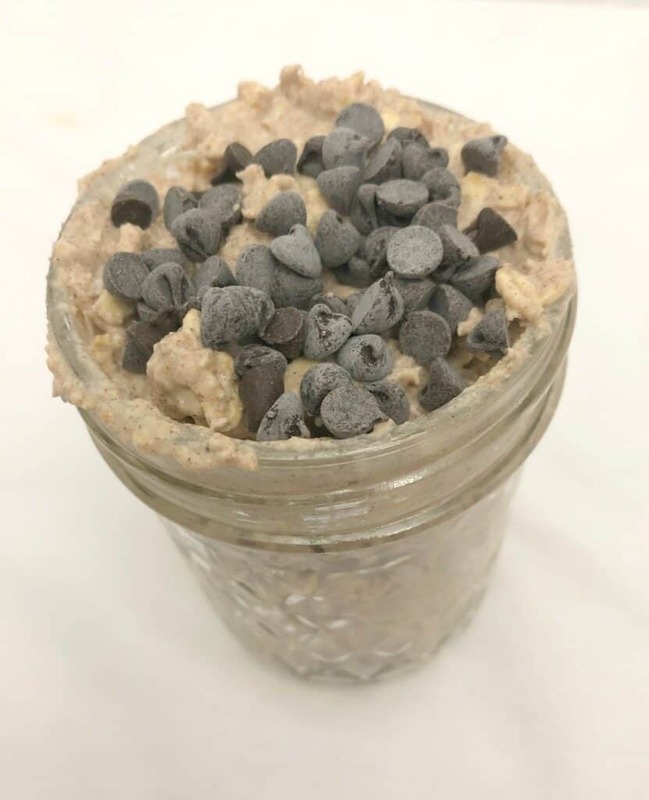 Cookie Dough + Overnight Oats = Breakfast. What could be better than that? If you’re lactose intolerant, having a dairy-free version I’d guess! I am way late to the overnight oats food train, but I am so glad that I still got on it! As a kid, I didn’t really like oatmeal. The instant packets (strawberry or peach only, sorry blueberry) that you added water to and microwaved were okay, but never my first choice. Then there was the savory oatmeal train, which I tried to get on but I just couldn’t stomach that one either. 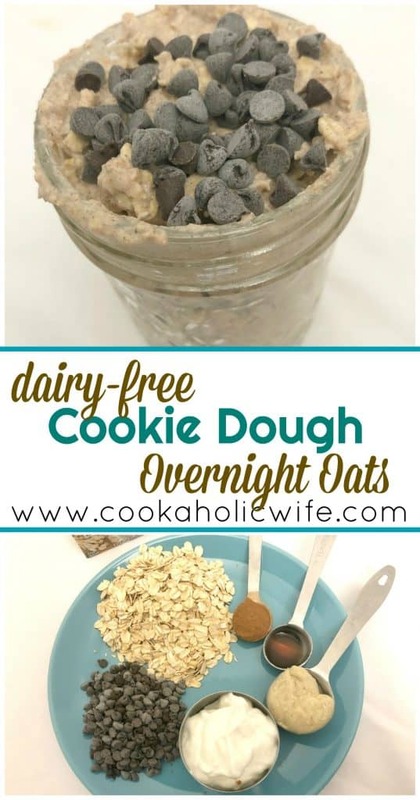 I actually tried overnight oats when they first become super popular and just couldn’t bring myself to eat them. Baked oatmeal was okay, but still not something I *wanted* to eat. But then this past summer I tried another overnight oats recipe and pretty much fell in love. 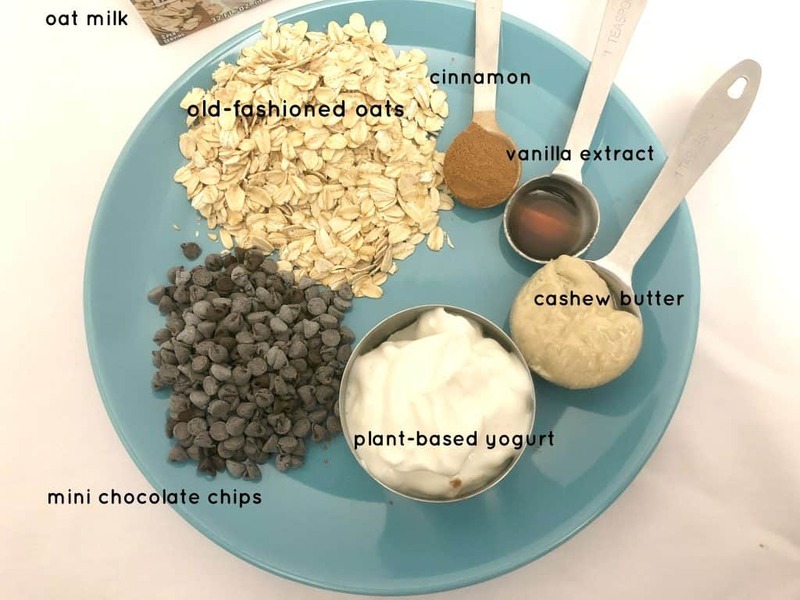 From then on, I was trying out different flavor combinations left and right, eating overnight oats for breakfast every day for nearly a month. They’re just SO good! And there are SO MANY POSSIBILITIES! So, I was super excited when I saw that January’s theme for the Fantastical Food Fight was overnight oats! Fantastical Food Fight is a monthly blogging event, hosted by Sarah of Fantastical Sharing of Recipes. Each month a theme is assigned and bloggers can make whatever they want as long as it fits within the theme. I don’t know about you, having prepared or grab-and-go breakfast and lunches during the week is key to my life. I usually prep everything on Sunday, but there are times where that just doesn’t happen and then I tend to end up in the drive-thru line of Dunkin or a fast food place. The best thing about overnight oats is you can easily whip them up while you’re prepping dinner. Stick them in the fridge, grab in the morning and you’re good to go. Combine oatmeal, Stevia, yogurt, vanilla extract, cashew butter and cinnamon into a wide-mouth mason jar or container. Stir to combine. Stir in mini chocolate chips and enjoy! 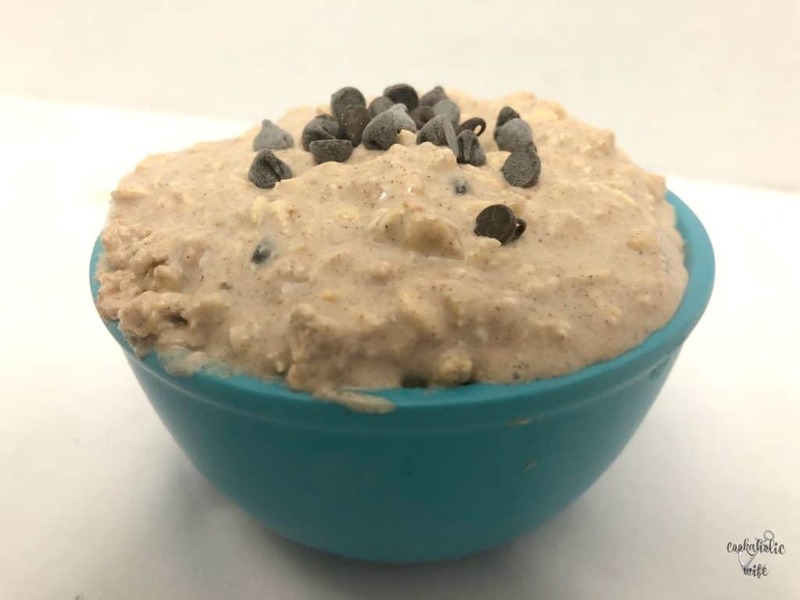 Dairy-Free Cookie Dough Overnight Oats! Take 5 minutes, then let your fridge do the work on this perfect grab-and-go breakfast made with oatmeal, oat milk, cashew butter and chocolate chips! 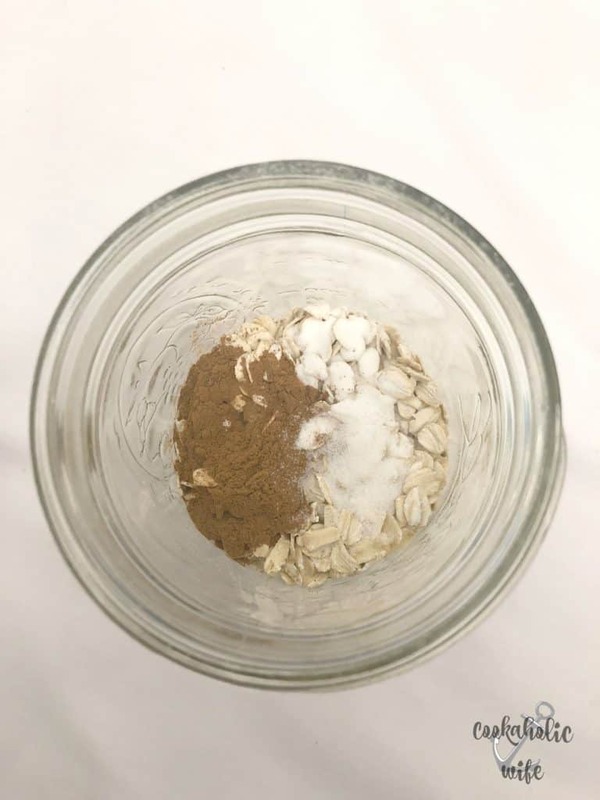 Combine oatmeal, Stevia, yogurt, vanilla extract, cashew butter and cinnamon into a wide-mouth 1 pint mason jar or container. Stir to combine. Have you tried oat milk? If you haven’t, I highly suggest you get right on that. Of all of the non-dairy milk alternatives, it is my favorite. The Pacific brand in vanilla? 😍😍😍😍 To die for! I swear, it is a total game changer in overnight oats. Anyway, the s’mores variety was definitely my favorite overnight oatmeal choice, but I think this cookie dough one has replaced that. I can’t get over how delicious they are, not to mention filling! There’s no need for a mid-morning snack (or five) after eating these. You remain full right on through lunch time! Love all of your suggestions for add ins! (P.S. I’m not a fan of savory oatmeal either). What a great selection of overnight oats!! I never cared for those instant packages either but I love a bowl of slow cooked oatmeal.